This is the Emerson type 21646 electric fan, manufactured between 1914 and 1916, and it is still running strong today - over 90 years later. "BUILT TO LAST" was the Emerson logo, and last they did. This Emerson electric fan has been restored to full operating condition and is ready to plug in and enjoy for another lifetime. Now is your chance to own a piece of Machine Age Americana, right out of the Industrial Revolution. This is a working antique. The Emerson type 21646 is the forerunner to the later 24646, 27646, 29646, etc. Although this basic design was used for many years to come, there were also many features that were changed and never used again. 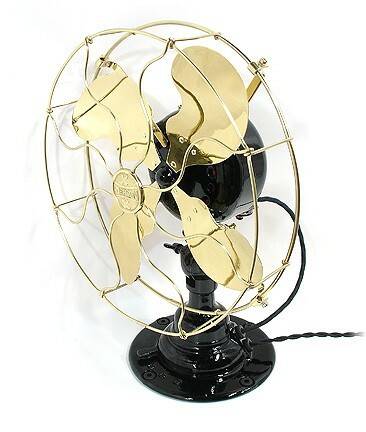 That is why this fan is so unique with its combination of solid brass wire cage, solid brass struts, solid brass cage badge, brass double hex acorn nuts, deco style step base, lever type oscillator control, and cast iron blade hub. These features were phased out with the later models. 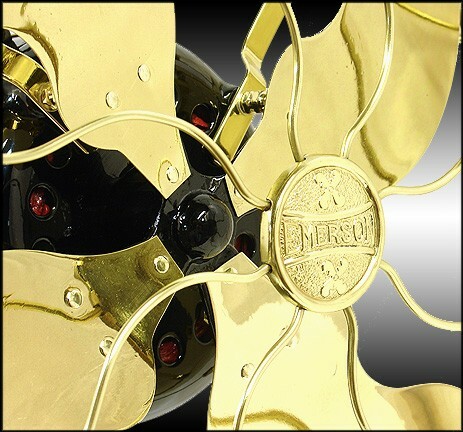 This fan features 12 inch Parker (unique to Emerson) solid brass blades, adjustable oscillator, and 3 speeds. The four brass blades, brass cage, and brass cage badge have been buffed, polished, and clear coated. The blades have been strobe light balanced to provide very smooth operation. In addition, the blades and hub were disassembled and processed separately. This procedure makes it possible to treat and prevent reoccurrence of the rust and corrosion between the brass and cast iron. They are reassembled with solid brass rivets and special tooling. The adjustable oscillator control is the "Ball Detent" control, which was Emerson's first of the easier to operate controls. It was patented in 1916, and is also known as the 1916 oscillator. 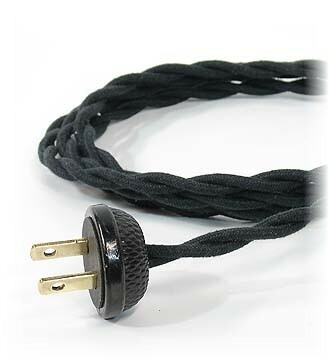 The motor cord and the line cord are black, cloth covered, twisted cords made especially for antique restorations. The antique bakelite plug is a period plug commonly used on appliances of the time. It too has been restored and is a beautiful addition to this restoration. The base, motor housing, and gear housing are constructed of rugged cast iron. Original bakelite, screw-in wire grommets (visible in above image) were saved and reused. Emerson designers were obviously concerned with the longevity of their products. Refinishing involved complete disassembly, stripping to bare metal, bead blasting, surface conditioning, and then coating with a top grade automotive finish system. The gun applied finish consists of a catalyst activated epoxy primer/sealer, 2 coats of a color base, and 2 coats of catalyst activated clear coat. This finish was chosen for its durability and depth of color. And it is stunning. You see my fans from every angle and they look brilliant in these images because they are brilliant. This is a view of the oscillator gear housing, oscillator swing adjustment, and motor positioning control. Oscillation can be adjusted from 0 degrees to 90 degrees of swing. Oscillator gears have been greased with a special gear lubricant and are ready for another lifetime of service. 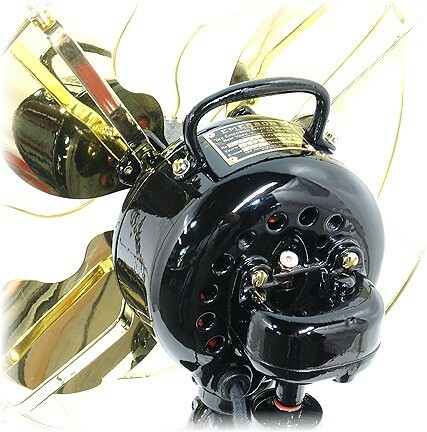 The motor is a powerful 4 pole motor that smoothly turns these large blades with ease. 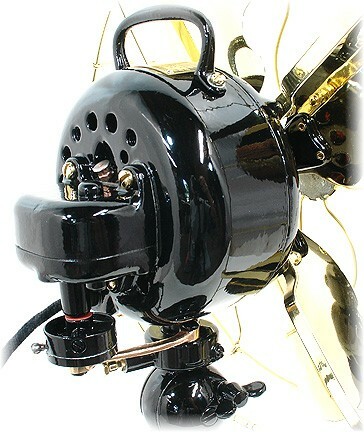 It features the unique Emerson single bearing, oil bath system, which is the most efficient ever in motor lubrication design. I run these vintage Emerson fans in my shop 12 hours a day, year after year. They are dependable, efficient and I've never worn one out. The original handle and gear case steel screws will be included to give the new owner the option of replacing the brass screws now installed. The steel screws have been refinished in matching black. 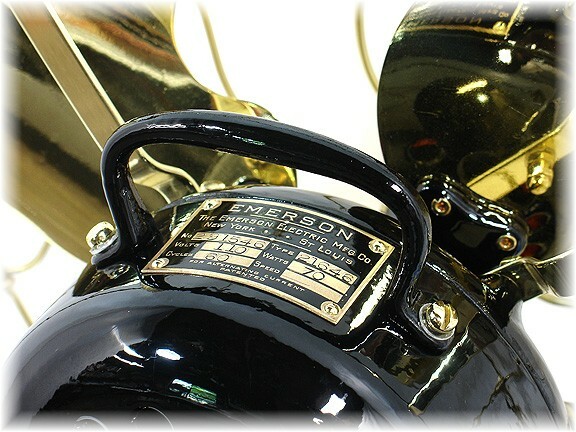 Beautiful brass motor badge provides the specs for this Emerson model 21646. Black background has been restored, embossed brass polished, and clear coat applied for preservation. The serial number on this fan is unique to this fan only. Serial numbers were later discontinued. 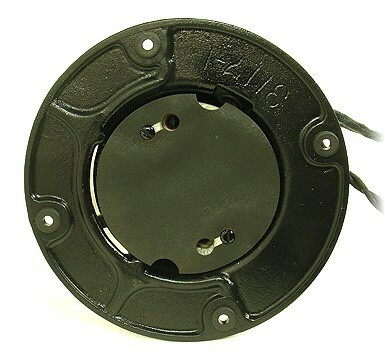 The fan base has four new rubber feet (grommets). 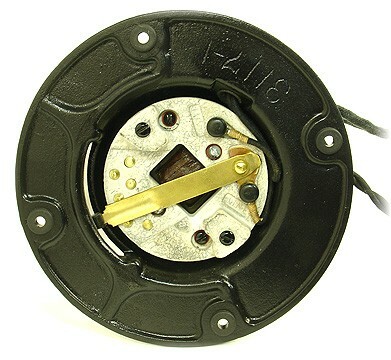 A factory original cover fits over the wire terminals on the bottom of the speed control. Speed control unit was completely disassembled to permit access to all contact surfaces. Contact surfaces were cleaned and smoothed, and proper knife switch tension reset. Solid ceramic base was bead blasted before reassembly. Speed control choke is thoroughly tested and coils rewound if necessary. 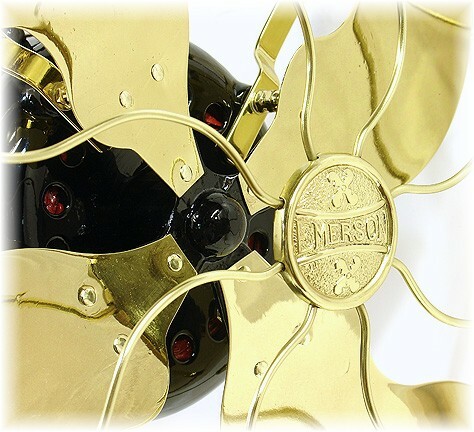 This Emerson electric fan has been very carefully, meticulously, and painstakingly restored. All of the many, many steps used in this restoration are too numerous to mention in this short description. The new owner will be proud to show it and will thoroughly enjoy using it. 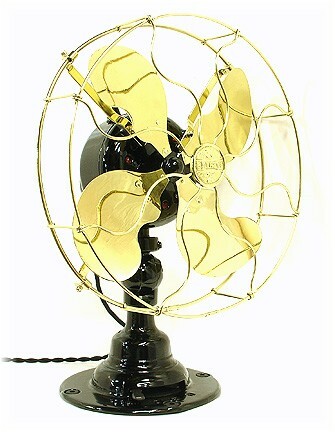 I have been collecting and restoring vintage electric fans for many years, and I stand behind my work 100%. 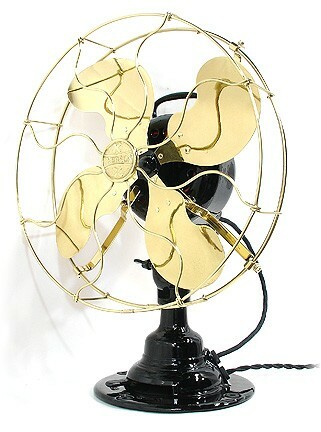 Also I am an active member of the Antique Fan Collectors Association. You can bid with confidence. Just check my feedback and see what others all over the world have said about my restorations. To reduce the possibility of damage in transit, this fan will be shipped in 2 separate cartons. Some assembly will be required. Assembly instructions and tools are included. Special motor lube is included also. Tech support via email or telephone is available and encouraged if there are any questions or doubts. Fixed shipping cost of $35.00 is approximately half of the actual freight charges for insured USPS Priority or UPS ground in the continental U.S. I pay the balance. Packaging is done with new materials and cartons. International bidders are welcome. 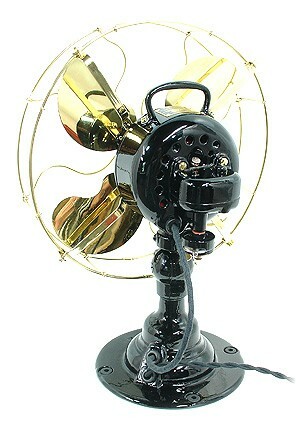 My fans have been shipped worldwide. Please email for shipping costs. Please check my other auctions, as I also enjoy restoring vintage telephones.